PDF Recovery Toolbox | Adobe PDF repair software. Fix corrupted PDF files. The Adobe PDF recovery software only read source file and don not modify it. How to Recovery PDF file damaged? How to recovery PDF file damaged? PDF Recovery Toolbox uses a highly efficient proprietary recovery engine, which enables users to restore most or all of the information from damaged PDF files that may appear irrecoverable for other tools. The program has a friendly user interface and can work with minimal user input, which may come handy for novices and intermediate users. PDF Recovery Toolbox like online damaged PDF recovery service - always avaible 24x7 via website download. The software also has a number of additional settings that can broaden the range of documents it can work with. The program does not modify the original file in any way. The recovery process only involves operations with the memory of your computer and the destination file. The software is provided in two versions: DEMO (free) and FULL (commercial). The trial version offers a full range of recovery capabilities, but the output file will only contain the first page of the document. All other pages will have the word DEMO written across them. This stage is used for selecting a file to be processed. You can either type the name of the file or select it using the Open File dialog or the list of previously opened files. This stage is optional, but we recommend changing the recovery settings prior to starting the work with a document. For heavily damaged files or in cases when the results of the recovery process did not meet your expectations, you can change the default size of document pages or the way the software processes data streams stored in the document. At this stage, the program performs a preliminary analysis of the document, identifies its structure, determines the location of text and other data, analyzes cross-link tables and performs other document processing actions. This stage is fully automated. Once the document analysis is over, the program prompts you for the name of the output file. By default, the software suggests saving the recovered document into the same folder the original file was located in, with a name composed of the original file name and the _repaired suffix. You can save documents in the PDF format of any version, from 1.0 (Acrobat Reader 1.0) to 1.7 (Acrobat Reader 8.0). By default, the software suggest saving the document in the format matching the format of the original file. If the document has been damaged badly and the program fails to determine the format version, it suggests saving the results in the latest version of the format. 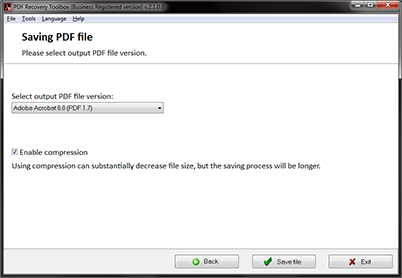 At the moment, the latest version supported by the program is PDF 1.7 (Acrobat Reader 8.0). Attention! : If you select a file version older than the version of the source file, some data incompatible with the selected version may be lost or corrupted. The work of the program at this stage is fully automated and does not require any input from the user. The trial version of the program only saves the first page of the document into the output file. The rest of the pages will have the word DEMO printed across them. To completely unlock the recovery capabilities of the program, you must purchase the full version of the program. The report is generated for each file processed during the current recovery session. You can go back at any stage and change the document recovery settings. You can also choose another PDF file to recover and exit the program at any time. The PDF (Portable Document Format) format was developed by Adobe in 1993. It utilized a fraction of the capabilities of the PostScript language and was a platform-independent open format of electronic documents, which became an international ISO 32000 standard in 2007. This format is extremely popular on the Internet and is widely used offline. The majority of manufacturers publish user manuals, product specifications and other electronic documents in the PDF format, while some computer components and peripherals, such as scanners and printers, support this format directly. Due to their universal nature and compatibility, PDF documents are often used as a means of document exchange in companies of all types, including public agencies. That's why PDF documents often contain important information not available in other formats and its loss can have severe consequences. This online PDF recovery tool helps to save many hours of work. Due to the fact that the PDF format is widely used on the Internet, PDF documents can be damaged due to connection errors and incorrect encoding, let alone the dangers caused by local factors, such as viruses and hardware malfunctions. PDF repair and recovery download first before install. PDF Recovery Toolbox is a powerful, efficient and easy-to-use data recovery solution for PDF files that will help you avoid losses of time and money. This corrupted PDF file recovery software allows you to quickly recover a seriously damaged file and does not require any special knowledge. If you are not satisfied with the results produced by PDF Recovery Toolbox, you can always send the damaged file to the program authors for in-depth analysis. Our tool do not repair encrypted PDF files.